Ants are among the most leading pests in households. Most ants have the ability to bite with their pincer-like. 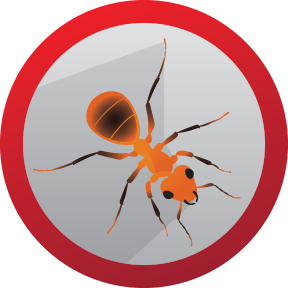 The reason for ants being the most bothersome pests is because they appear in large numbers and can nest in wall cavities or other part of structures. When ants are in nature, they can perform advantageous functions by preying on certain species of insect pests andaerating soils. Ants are part of the insect order Hymenoptera, which makes them close relatives of bees and wasps. Ants are social insects that have duties which are divided among different types of adult individuals. Queens conduct the reproductive functions of a colony, which include laying eggs, participating in feeding and grooming. Females that are not able to reproduce become workers that gather food, feed, and care for the larvae, build tunnels, and defend the colony. Larger workers with well-developed jawbones are called soldiers. Males do not contribute in colony activities; their only apparent purpose is to mate with the queens, after which the male dies. Males are usually larger than workers, but smaller than the female reproductive. 1. Ants have elbowed antennae and termites have straight, bead-like antennae. 2. Ants have pinched waist lines, while the bodies of termites are virtually the same width from end to end. 3. The front wings of ants are longer than their rear wings, while both pairs of wings of termites are about the same length. Ants have a complete metamorphosis; the development stages they have are egg, larva, pupa and adult. Ant eggs are very small and vary in shape according to species. Upon hatching a soft, legless larva is formed. After feeding and passing through several molts, the larvae pupate. The pupa bears a resemblance to the adult, but it is soft, white and does not move or feed. The adult may require a few days to attain complete maturity after developing from the pupal stage. Six to eight weeks or more are required for the development from egg to the adult stage can be complete. Ants require water for drinking and will travel long distances for it if necessary. This is normally the reason for finding most ants in kitchens or bathrooms of residences or commercial buildings. The types of ants that invade homes and buildings include the Argentine, odorous house, pharaoh, thief, and carpenter. Other species such as imported fire ants may be occasional indoor pests. Harvester, cornfield, pyramid and other species of ants usually nest outdoors but can also occasionally invade structures.